A widely held misconception is that ankle braces are only used by sports enthusiasts. The truth is that an ankle brace can be an effective tool in preventing and treating everyday injuries as well. Ankle injuries are the most common type of musculoskeletal injuries in both athletes and sedentary individuals, accounting for an estimated 2 million emergency room visits per year in the U.S. alone. Braces provide protection and support for a wide range of injuries, including chronic ankle pain, arthritis, tendinitis, plantar fasciitis and inflammation. While not a treatment for ankle injuries in itself, a brace may be recommended by a physician as part of a rehabilitation program designed to restore balance, endurance, range of motion, and strength to a sprained ankle. Choosing the best ankle brace for your needs from the hundreds that are available can be a daunting task if you don’t know what you’re looking for. But first, let’s look at what ankle braces do, who they’re meant for, and what you should look for when shopping for an ankle brace. An ankle brace is a protective device that can be effective in preventing injuries during activities that require rapid body weight shifts from one foot to the other. Originally designed for use by professional athletes, ankle braces can be purchased at many drug stores, sporting goods stores, and online retailers. There are many different types of ankle braces available – from basic neoprene sleeves that provide moderate compression to rigid braces that completely inhibit the movement of the ankle in order to relieve pain, speed healing, and minimize the risk of re-injury to the ankle. The most common cause of ankle sprain is inversion, which is the inward rolling of the ankle toward the arch of the foot. Another less common type of ankle sprain is eversion, which occurs when the ankle rolls outward. Ankle braces are designed to restrict the movement of the ankle and help minimize inflammation following an injury. Depending on the severity of the sprain, an ankle brace can be worn from 10 days to six weeks. Ankle braces can also be used to prevent injury while running or playing sports that involve a lot of jumping – such as basketball or volleyball. There are four main types of ankle braces: sleeve ankle braces, lace-up ankle braces, post-injury ankle braces, and rigid ankle braces. Below, we’ll take a look at the features, advantages, and disadvantages of each type of ankle brace. Lace-up ankle braces are typically made from nylon or vinyl. Their lace-up design allows the wearer to easily adjust the tightness of the brace. Lace-up ankle braces are widely available in department stores, pharmacies, and sporting goods stores. Lace-up ankle braces are the least expensive type of brace available, as they don’t require a custom fit. Another advantage of the lace-up ankle brace is that it can double as a prophylactic. Post-injury ankle braces are sometimes referred to as stirrup braces. They feature a semi-rigid design with a hinge that allows for the upward or downward flexion of the foot (plantarflexion and dorsiflexion). Post-injury braces can be purchased at some higher-end pharmacies as well as through medical supply companies. These braces are either air- or gel-filled and can be chilled or heated for more effective treatment of ankle sprains. Rigid ankle braces are designed to be used as part of a complete rehabilitation program. They offer the highest degree of protection and are often used by professional athletes. There are two types of rigid ankle brace: lace-up braces and stirrup braces. Rigid lace-up braces feature plastic inserts that press against the sides of the ankle to prevent it from rolling inward (inversion) or outward (eversion). Rigid stirrup braces have a hinged design that allows for dorsiflexion and plantarflexion, but they also feature extra straps that wrap around the ankle for added support. Rigid ankle braces are generally the most expensive type of ankle brace available. They can be purchased through medical supply companies. 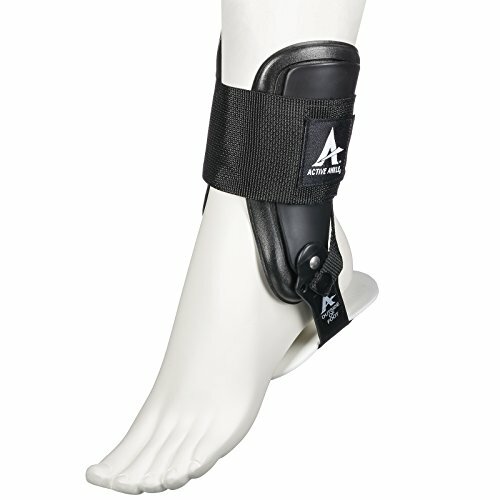 Sleeve ankle braces feature a pull-on design without any straps, hinges, or laces. These types of braces are widely available in online shops, pharmacies, and sporting goods stores. Sleeve ankle braces offer less support than other types of braces, but they provide moderate compression that can help relieve the pain, swelling, and inflammation associated with arthritis, plantar fasciitis, and tendinitis. There isn’t one single ankle brace that is right for everyone. The ideal ankle bracelet for you will depend on your individual needs. That said, you’ll want to be sure to choose a brace that fits properly, is made of a comfortable material, and provides the right amount of support. Below are the specific features you should be looking for in an ankle brace. The ankle brace should be tight enough to stabilize the ankle but not so tight that blood flow is restricted. The tightness of an ankle brace is determined by the level of support it provides; generally, the less supportive the brace, the wider range of movement it will allow. Ankle braces with straps or laces provide maximum support while allowing you to customize the tightness of the brace for different activities. Ankle braces can be made of fabric, knit materials, or neoprene. If breathability is important to you, a brace made from fabric or knit materials is deal. If, however, you want to take advantage of therapeutic heat, choose non-breathable neoprene. Sleeve ankle braces are the least supportive brace, while lace-up ankle braces offer maximum support. When choosing an ankle brace, consider how much support you need and how much lateral movement you want the brace to provide. Some ankle braces have straps that provide extra compression and support. There are two general strap configurations: figure 6 and figure 8. Choosing the right configuration for you will depend on how much compression and ankle support you need. Straps that are in a figure-6 configuration provide extra protection from lateral movement, while figure-8 straps provide full wraparound compression. In this section, we’ll look at the best ankle braces that are currently available on the market. Whether you have chronic ankle pain, are recovering from a sports injury, or want to prevent an injury, one of the following braces is sure to suit your needs. The McDavid 195 is one of the most popular ankle braces on the market. It provides Level 3 ankle support (the highest degree of support available) and features a figure-6 strap configuration, a built-in arch, padded lining, and a ventilating tongue. We love the compression and support provided by the McDavid, but some users have reported that the brace feels too stiff. Another complaint is that the McDavid 195 is too bulky to wear under athletic shoes. 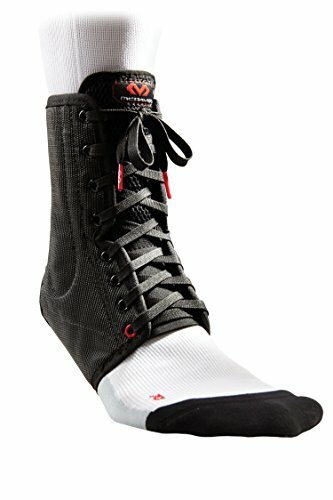 If you’re looking for a lightweight, comfortable brace that stabilizes and compresses the ankle, the McDavid is a good choice. If, however, you suffer from tendinitis or other heel injuries, this may not be the best brace for you. Med Spec’s ASO Ankle Stabilizer is an ideal choice for those recovering from sprains and other ankle issues, as it features a rigid design that stabilizes the ankle in a 90-degree angle. The ASO Ankle Stabilizer also fits well under many types of shoes, making it a great alternative to a post-surgery boot. This brace is made from ballistic-grade nylon, which ensures a durable, yet lightweight wear. It also features Med Spec’s own “Cool Flex” lining, which allows your feet to breathe. Figure-8 stabilizing straps wrap around the ankle for added support, while laces let you easily adjust the brace according to your comfort level. Its relatively low price makes the ASO Ankle Stabilizer perfect for those on a tight budget, but some reviewers have complained that the brace fits too big. Another common complaint is that the brace doesn’t have enough padding. 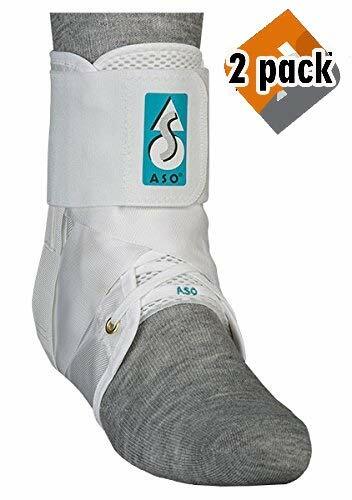 Overall, though, the ASO Ankle Stabilizer a great all-in-one solution for those recovering from ankle injuries. The McDavid 199 Lace-Up Ankle with Support Stays is designed to deliver maximum support while also offering more flexibility than comparable braces. The lace-up design makes the McDavid 199 easy to adjust for different activities. Nylon and mesh layers ensure breathability, while McDavid’s proprietary HydraVent hDc Moisture Management Technology wicks moisture away from the feet. While the McDavid 199 provides excellent support for running and other high-intensity activities, many users have found this brace to be a bit too rigid for use during normal daily activities. 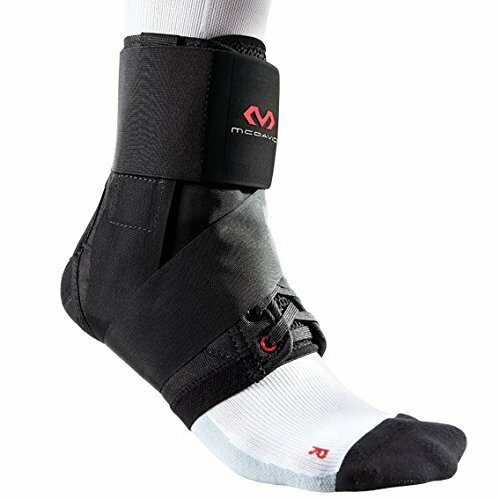 If you’re looking for a brace to support your ankle while recovering from surgery or an injury, the McDavid 199 is an excellent choice. If you need flexibility and mobility, however, you may want to consider a less rigid brace. The Active Ankle T2 Ankle Brace is different from other types of ankle braces in that it does not have wraparound straps, laces, or a sleeve-type design. Instead, it features a bi-lateral hinge design, a unique single-strap fastening system, and a platform heel that helps stabilize the foot and ankle. This is one of the easiest braces to use; all you have to do is slip the brace on and secure the single strap in place. If you’re looking for a high-end brace to help you recover from a serious ankle injury, the Active Ankle T2 Ankle Brace is worth considering. Those looking for everyday support, however, may find the T2 too bulky and inflexible. 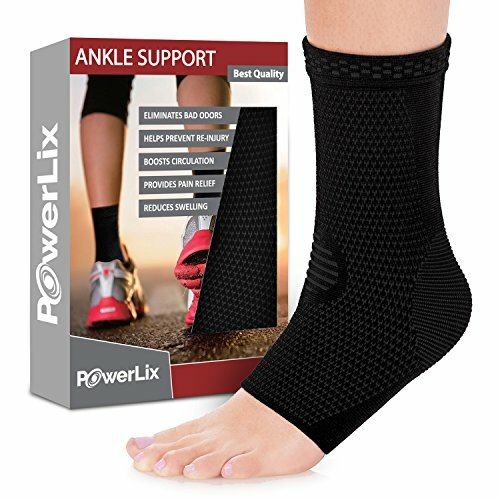 The PowerLix Ankle Brace features an innovative four-way compression design that can help with a wide range of conditions – including arthritis, muscle fatigue, swelling, plantar fasciitis, and chronic ankle pain. This brace offers the extra protection needed for high-intensity activities like sports and workouts, while also remaining flexible enough for everyday activities. Its sleeve design allows the brace to fit easily under any type of shoe, while a special knitted fabric ensures maximum comfort and moisture wicking. While this brace offers exceptional support and prevention of lateral ankle movement, some users have complained that the PowerLix is too tight. Despite these minor niggles, the PowerLix is a good choice for those who only require moderate compression and support for sports and everyday activities. Whether you want to prevent an ankle sprain, are suffering from ankle pain, or are recovering from a serious injury, there is an ankle brace on the market that can help relieve pain, reduce swelling and restore a full range of motion to your foot and ankle. While there is no one brace that’s right for everyone, the information and reviews above should help you find the best brace for your individual needs.